HMIRC Concept – Ryan/Smith Creative | Andrew Sutton, R.G.D. This is a concept I did for Hazardous Materials Information Review Commission’s 25th Anniversary Annual Report under the art direction of Charlie Smith, Art Director/Owner. This is one of my absolute favourite designs. The concept was a timeline with 25 years of accomplishments, events, and successes starting with WHMIS. The flowing water symbolizes constant movement forward into the future. I also like how the 4/4 cover switches to a 2 colour interior. This concept was never chosen. Bits and pieces of it were merged with bits and pieces of other competing concepts. Clients will be clients. 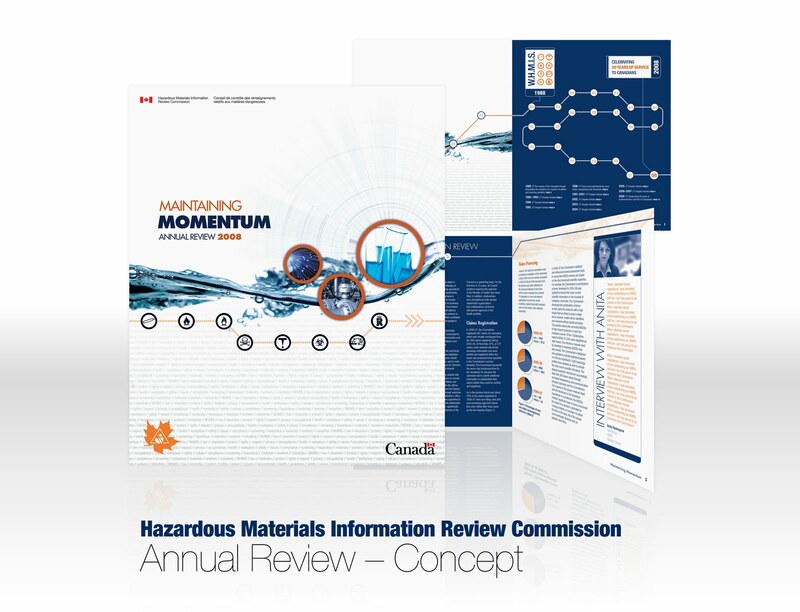 This entry was posted in Ryan/Smith Creative and tagged Annual Report Cover, Chemical, Concept, Creative, Graphic Design, Hazardous, Ottawa by Andrew. Bookmark the permalink.